Lunch today was . . . interesting. . . entertaining. . .something else for sure. LOML and I decided to just go to the Chinese Buffet. To start off with, the music choice for today was hilarious. It was not the usual Chinese/ Japanese classical, slow, stringed instrument variety. OH NO!! This was of the "Three Stooges in the Old West" variety. LOML and I were sneaking grins at one another over the sneeze guard, waiting for a pie to get flung in our faces. As we were so keen on listening to the music, we quickly noticed when the tune changed to "Happy Birthday." Not so weird, except that over the music was a man talking in, I dunno, Chinese perhaps. He did NOT sound like he was wishing a happy birthday. I immediately decided we were being brainwashed. It was just THAT eerie-sounding. When the man's voice stopped, the volume of "Happy Birthday" increased significantly. The song was then sung in both the other language and in english, as well as a few choruses that were just the music. It must have repeted this loop about two dozen times. Seriously! That was the LONGEST version of "Happy Birthday" I've ever heard. 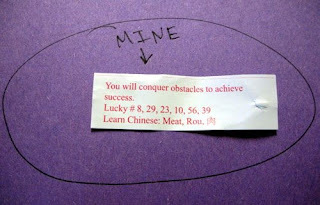 Finally, our fortune cookies arrived. Some time ago, LOML and I resorted to calling them statement cookies because the ones we've gotten tended to just be good, solid advice rather than a fortune. For example, here's the one I got today. It's a standard statement cookie. 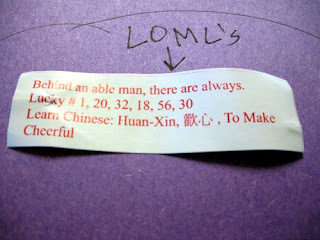 LOML's was a bit more mysterious. It's more of an incomplete sentence cookie. Any ideas? Me neither. Yes, I know a report on my lunch adventures is very random - perfect for "Totally Random Tuesday"
12 guilty pleasures of geeks (some of them I completely get - some I just don't understand.) How big of a geek are you? Do you get all these? Camels in car (totally WTF!!) But funny!!! Check out these celebrity recipes. So, that's it for now. I didn't get much done in the craft room yesterday and am knocking off a bit early today to try again. We'll see how it goes.